The aim of Web of Connection is to foster a greater awareness of humanity's capacity to live in harmony with each other and the planet we share. We do this through educational programs and demonstration projects that increase knowledge, skills and attitudes for a healthy mind, body and spirit. Rooted in the Buddha's Dhamma and incorporating teachings from other non-dual traditions, we strive to further understanding of the interconnectedness of all life so that we can act responsibly and regeneratively in our shared home. Your generosity is what makes it possible for our programs to continue to touch the lives of many people. As our community develops, we will be able to provide a more extensive example of a sustainable lifestyle that nourishes body, mind and spirit. Each one of us is an integral part of this WEB. 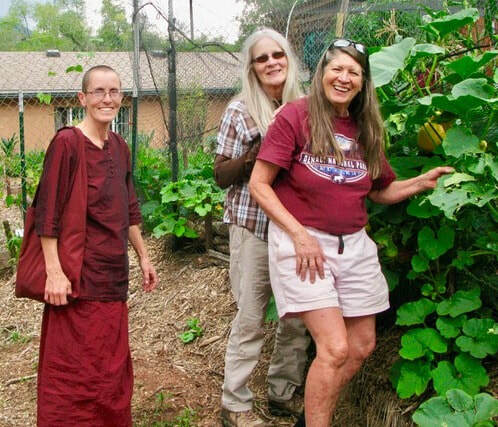 As an alms mendicant bhikkhuni living outside the support structure of a monastery, Ayya Dhammadhira relies on the ongoing support of individuals like you to continue her practice and service in community. Your monthly contributions are much appreciated. Thank you for your support! Web of Connection is a 501 (c) (3) federal non-profit organization. All donations that you make are tax deductible. We see community as the catalyst and crucible for positive change in the world. When we come together to listen to each other's experience, we gain the kind of understanding that helps build bridges and friendships in a society that has become deeply fragmented. As we work together for a common goal, we accomplish much more than we could on our own and demonstrate the power of synergy and cooperation. We welcome people from all walks of life to join us in discovering the potential of the human heart to transform fear and ignorance into love and awareness. In a world torn by divisions and strife, we counter these destructive impulses by developing attitudes of kindness and understanding through dialogue and collaboration. All spiritual traditions are honored for the wisdom that they offer. We hold respect, generosity and kindness toward all beings as core values. When we embrace the complexities and paradoxes of our shared humanity, we are able to go beyond dualities and recognize our inherent fullness - a fullness that includes rather than excludes the "other". Boundaries and barriers that once felt solid and insurmountable melt in the light of a newfound awareness. Deer Park is the name of the center in Colorado Springs where our programs are held. This name not only indicates the frequency of the wildlife who also make their home here, but is also derived from the place where the Buddha taught his disciples. It was often in groves and forests that life's most important lessons were presented. In fact, the word "Dharma" or "Dhamma" can be translated as "the way of nature". It's no surprise that the deepest truths about ourselves are also reflected in the natural world. This is because we are not separate from the whole. Through retreats, discussions and hands-on projects, you are invited to learn how natural principles can be applied to all aspects of our lives. Karen helps with the harvest of produce from Deer Park's Community Supported Agriculture (CSA) program. Learn how you can be more involved. "The web of life both cradles us and calls us to weave it further."